Beneath the ice pack on a small black fabric cooler sits more than trim, smelly buds of cannabis. Botanical Elements Owner Justin Bonfield carries a slew of medical marijuana products, each one designed to serve a specific function. There are lotions and salves to sooth aching muscle pains and arthritic joints. 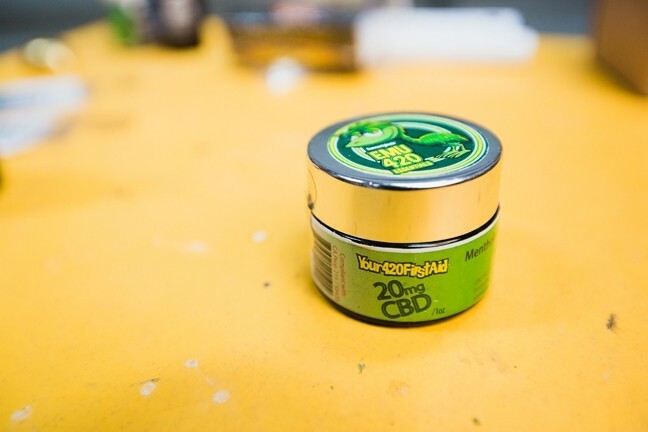 There are pills and oil made purely of cannabinoid (CBD) compounds found in marijuana—not THC, which creates the “high” that pot is infamous for. There are chocolates, caramels, and peanut brittle. GREEN MEDS: Mobile dispensaries struggle to stay in compliance with local ordinances, and one is attempting to go stationary. And, obviously, small sealed bags of the plant’s dried flowers. This stuff is designed for cancer patients, people with epilepsy and seizure disorders. It’s for people living with chronic pain and arthritis. It’s used as a sleep aid, as an appetite stimulant. It seems like the list is endless. And those are just the patients to whom Bonfield’s nonprofit medical cannabis collective delivers medicine. According to the California Department of Public Health, 1,253 medical marijuana recommendations have been issued in Santa Barbara County since 2004, and 711 have been issued in San Luis Obispo County. Each of those recommendations is good for 12 months, and doctors need to re-recommend medical pot for patients annually. Botanical Elements is one of several mobile dispensaries servicing those recommendation carriers on the Central Coast. It’s pretty much the only way patients in this area can get the medicine. 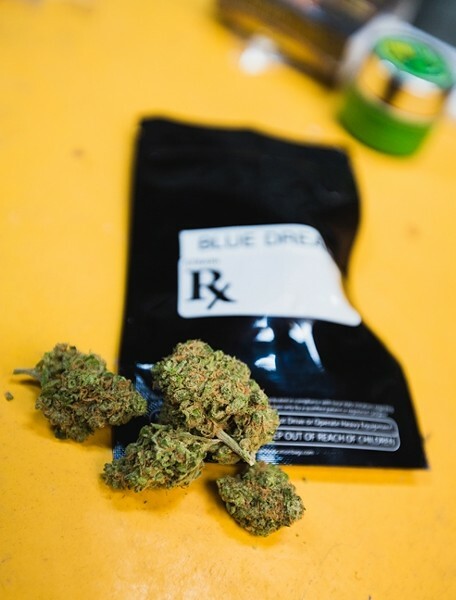 Unless they want to drive a few hours, their medical marijuana has to come to them because there are no storefront, brick-and-mortar dispensaries in SLO or Santa Barbara counties. Dispensers-on-the-move are pretty easy to find, though: They advertise in local papers and are listed on such sites as weedmaps.com. But the model isn’t exactly efficient, drivers are sometimes robbed, drivers can’t always go where patients need them to, and, of course, there’s always the threat of being pulled over. Plus, not every city allows mobile—or brick-and-mortar, for that matter—dispensaries to operate within city limits. It’s been illegal in Santa Maria since 2013. Basically, Bonfield said, he’d love to operate out of a storefront, to give Botanical Elements collective members a safe place to retrieve their medicine. But that seems like an improbable goal. Storefronts are banned in the unincorporated areas of Santa Barbara County, and SLO County has a pretty restrictive ordinance as to where a brick-and-mortar facility could set up. Several collectives have unsuccessfully attempted to erect stationary pot shops since the infamous raid on a Morro Bay dispensary in 2006 and a handful of raids in Santa Barbara from 2008 to 2012. That history isn’t stopping the Ethnobotanica Patients Cooperative, another mobile dispensary servicing the Central Coast, from throwing itself on the mercy of SLO County Planning Commissioners and almost inevitably on the mercy of the SLO County Board of Supervisors, as well. The co-op is in the initial planning stages of attempting to put a storefront dispensary in Nipomo, and if the South County Advisory Council meeting held in February gives any indication of the project’s future prospects, getting SLO County to go green isn’t going to be an easy task. The meeting was packed, and a number of residents shared their angry opinion about the industry itself. Others spoke about not wanting a weed shop in Nipomo, and still others said they were concerned about safety, parking, traffic, legal issues, and the characters who might hang around the shop. SLO County District 4 Supervisor Lynn Compton spoke at the meeting, saying she expected the decision to come before the county Planning Commission in May, and then be appealed to the Board of Supervisors. Although she can’t officially offer an opinion on the matter until it comes before the board, she did speak a little bit about the four instances where brick-and-mortars have tried and failed to step into SLO County since 2006. Luckily for Ethnobotanica, the organization is more than equipped to dig in and fight for its right to be a legitimate business. A small group of medical cannabis patients started the collective in San Luis Obispo while trying to figure out a way to make obtaining their medicine more affordable and readily available. “In San Luis Obispo, at the time, there wasn’t anything, I don’t think,” said Stephanie Kiel, who’s soft-spoken, passionate, and runs the business side of things for the collective. There was no safe, or non-black-market way for cannabis patients to obtain their medication, she added. That was in 2004, and the climate in SLO wasn’t exactly friendly toward medical marijuana collectives. “It’s not really great now, but it was much worse back then,” she explained. 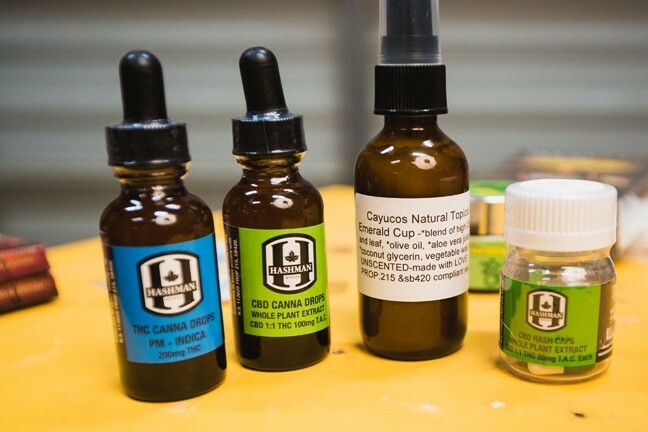 CBD THERAPY: Many of the products carried by Botanical Elements, a mobile dispensary that serves medical marijuana patients up and down the Central Coast, don’t have high amounts of THC in them. THC is the compound in cannabis that gives people a high. The therapeutic qualities of CBD, another cannabinoid compound found in marijuana, are what Botanical Elements tries to focus on. 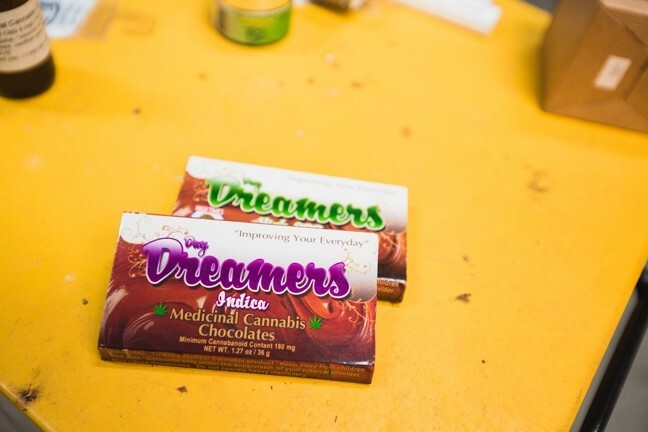 Products include pure CBD oil, tinctures and lotions that contain it, capsules, chocolates, and other edibles. The mobile dispenser also distributes various strains of marijuana in its most basic form, the bud. Different strains contain varying quantities of THC and CBD; each was created to treat a different illness. In 2004, collectives or cooperatives were authorized under Senate Bill 420, which expanded the California Compassionate Use Act of 1996 (Proposition 215), to grow, distribute, and/or sell medical marijuana on a nonprofit basis to their members. Ethnobotanica and Botanical Elements are licensed through the state as mutual benefit nonprofit corporations with sellers’ permits to dispense cannabis to patients. Patients have to prove they have a doctor’s recommendation in order to belong to a cooperative. When they do become a member, the cooperative is then authorized to grow marijuana and bring in products on behalf of that member. The members pay for service in return, just like they would to purchase pharmaceuticals at the pharmacy—only insurance coverage doesn’t enter the payment equation. Collectives such as Ethnobotanica and Botanical Elements ensure that patients without the money to afford medication can still access what they need by providing it on a sort of sliding scale. As Ethnobotanica picked up new members, it looked north for business opportunities—not to snag new members, but to grow for the SLO-based patients it already had. Santa Cruz County was clearly more open to the idea of allowing collectives to grow marijuana, and so the base of operations moved to Watsonville in 2008, where Ethnobotanica rented a warehouse to grown cannabis indoors and “make things more official,” Kiel said. went through with the state, they had a warehouse, they purchased new equipment, they started cultivating their plants, and more members joined. officers who participated in the raid were destructive, cutting power cords to lights rather than unplugging them, chopping and damaging plants. Law enforcement didn’t find any cash stashes or guns in the building; there was no evidence that the collective was participating in any black-market activity. The legal process took a couple of years, but eventually Ethnobotanica won the court battle, and the county Sheriff’s Department was forced to turn over the equipment and plants confiscated from the collective during the raid. Still, Kiel and her partners essentially restarted from scratch. In 2011, the collective applied for a building permit with the city to make some changes to the interior of the structure. Ethnobotanica went through the planning department, spent money applying, and was issued a building permit. Then, it started getting notices from the city of Watsonville that there was a ban on dispensaries. But the collective wasn’t operating a dispensary out of Watsonville; it was simply growing marijuana. Ethnobotanica once again prevailed, slogging through the process with a victory in the end—permit in hand, allowed to function as a business, and able to make changes to the interior of the warehouse in which it operates. So the collective is two-for-two, a clean sweep in the legal battle over a confusing conundrum of marijuana laws that regulate its medical use in the state and ban it at the federal level. After the Watsonville warehouse was raided in 2008/2009, Kiel said there was a point where they almost gave up the fight. The collective was stuck in a two-year lease for a building it couldn’t use as the case snaked through the legal process. She said her landlady was stubborn—in the best way possible. The landlord told them she believed in what Ethnobotanica was trying to accomplish and what they were doing. Ethnobotanica’s next battle won’t take place in a courtroom—at least not before Kiel makes her case in front of the SLO County Planning Commission later this year. She said having a storefront dispensing location was always a goal, from that small 2004 beginning. Even though the collective grew from serving members in SLO to delivering cannabis all over the Central Coast, Kiel said it’s always been about meeting that initial need. The proposed location on Hutton Road in Nipomo, just north of the Santa Maria River bridge, isn’t ideal as far as the business is concerned—Kiel said she would love a more central location—however it is one of only a few places in SLO County that fit within the confines of the dispensary ordinance. Louis Koory, an attorney with the Mission Law Center in SLO who specializes in medical marijuana cases, said the ordinance makes the process very difficult. For instance, the dispensary location needs to be zoned for industry and can’t be within 1,000 feet of a school, park, or day care center. That pretty much prevents potential dispensaries from having an urban location and shoves them toward less populated areas. But even in those areas, there are location issues. Kiel said it’s sort of a catch-22. So the collective has proposed to dispense in an area that complies with the ordinance, and then something like law enforcement response time becomes an issue. “It’s very frustrating,” she said. For security purposes, the facility would have several alarmed, electronically locked doors that have to be opened with a key card; a security guard; security glass; panic buttons; and 24/7 surveillance. But because of the out-of-the way location on Hutton Road, South County Advisory Council members said (during the February meeting) that they were concerned about police response time to the facility. The closest sheriff’s substations are in SLO County’s Oceano and Santa Barbara County’s Orcutt. In an emailed a statement to New Times, SLO County Sheriff Ian Parkinson said the Sheriff’s Office has several significant concerns with the proposed project. “Among them: the proximity of the dispensary to Santa Maria and the city’s high crime rate, the fact that Santa Barbara County has a ban on marijuana storefront dispensaries, and the Sheriff’s Office being able to provide law enforcement protection to that area where the dispensary is located. The Sheriff will reserve further comment at the appropriate time in the application process,” the statement reads. Kiel said the response-time issue is an important one to address, and Ethnobotanica has already proposed that the county impose an extra tax on dispensary sales to help pay for an additional SLO County Sheriff’s deputy to patrol the area. Of course, response time, safety, and security aren’t the only issues the advisory council raised at February’s meeting. There are also concerns with the juxtaposition between state and federal laws, what’s legal, and perceptions about medical marijuana users. Kiel said there’s this inherent, scary sort of uncertainty built into the medical marijuana industry because state and federal law don’t agree on the legality of cannabis for medical purposes. Just over the bridge from Nipomo, the city of Santa Maria bans both mobile and stationary dispensaries. Basically, if you’ve got a medical marijuana recommendation and you live within city limits, you have to drive somewhere else to find your medicine. But if it’s considered legal in the state of California, why ban it? Because federal law doesn’t recognize medical marijuana as legal, cities like Santa Maria have chosen to ban any sort of distribution within city limits, and local and federal law enforcement agencies can raid dispensaries. But, he said, things are starting to change and will continue to change in the future. He added that there’s currently a moratorium of sorts on prosecuting medical marijuana cases in the United States. The LA Times reported that a small provision included in the fiscal budget passed for the 2014-2015 fiscal year lifted the federal government’s ban on medical marijuana—at least for the fiscal year. At the beginning of March, a bipartisan group of senators introduced a bill, S.683, called the Compassionate Access, Research Expansion, and Respect States Act. The CARERS Act would, among other things, make medical marijuana legal at the federal level, enable banks (they’re federally insured) to work with businesses in the industry, allow medical research, reschedule cannabis from a Schedule I drug to a Schedule II, and allow Department of Veterans Affairs health-care providers the option of prescribing marijuana in the states that allow it. All of that adds up to making the industry more legitimate all around, and it would mean there wouldn’t be any more federally led raids in California. The bill is gaining traction in the Senate and has a companion bill in the House of Representatives. Currently the CARERS Act is at the Senate Judiciary Committee level. U.S. Rep. Lois Capps (D-Santa Barbara) said she’s long been a supporter of states being able to determine their own medical marijuana laws. “I strongly believe that it is a waste of federal resources to prosecute medical marijuana users and dispensaries, which is why I have voted in favor of legislation to prevent the prosecution of individuals who are acting in compliance with state medical marijuana laws,” Capps said in a statement. Kiel said passing a law like the CARERS Act would bring a lot of certainty to the medical cannabis industry in California, and probably make it easier to put something like a brick-and-mortar dispensary in SLO County. Botanical Elements owner Bonfield said he spends a good amount of time trying to stay current and in compliance with moratoriums and bans. “You know, just decriminalizing it or rescheduling it could help so much,” he said. That way the patients Bonfield serves, such as 36-year-old J.A., who was recently diagnosed with multiple sclerosis, will continue to have a reliable way to get medications that help—medications other than oxycodone. J.A. said he’s taken both oxycodone and cannabis for the sharp, crippling pains that take over his joints sometimes. His doctor prescribed oxycodone at first. He said his body would get used to whatever level was being prescribed, and the pain would start to come back, so the doctor would increase the dosage J.A. was taking. He started experiencing side effects, and became worried about oxycodone’s addictive qualities, so he looked for another option. “It would have never ended,” J.A. said of the oxycodone prescription. Contact Managing Editor Camillia Lanham at clanham@santamariasun.com.